While IndyRob makes some good points, the blow-me-away preparations involved low-and-slow stuff like short ribs and carnitas. I'd give them a whirl early. While I agree with this, I would add that if you (or someone you love) is hesitant about eating rarer pork, having the ability to pasteurized a chop at say 138F, vs. cooking it at 160 is pretty special too. Besides that, I think SV for tender cuts is really just a consistency/convenience issue. I find that I can achieve the same consistent doneness throughout typical of SV with conventional methods (and probably with better flavor), but it takes a lot of active time and I mess up sometimes. It was either Under Pressure or Momofuku that had said the SV'd short rib is the best example of why you just spent all that money. Go for it! I did bison the other night and the result was a tender, moist rib eye, evenly done throughout, whereas conventional cooking might have dried the meat. What Angela will enjoy discovering is the consistancy and ability to replicate with sous vide cooking. I recommend doing the same protein a couple times and finding this benefit. Try chicken breast at 60C. The tenderness and moistness of the meat is a very pleasant surprise. I agree AND you need to make sure that you use good-quality meat. Boneless short-ribs and skirt steak have been my go-to meats for impressing people that don't know about sous-vide BUT recently I got some short-ribs from a butcher that I hadn't used before and the results were quite mediocre. The meat was tender but not flavorful. Well, if you're like me, you'll want to try a few different things in short. So beef filets or pork chops would be good starts. Anything tender that benefits by being cooked precisely. I would hold off on the tougher cuts until the novelty has worn off a little, so the longer cook times aren't tying up the machine for long periods. I agree completely. My favorite SV'd things after a year of playing, have been the meats I refer to as "well exercised." For instance, pulled pork made from the picnic is superb and has totally replaced my crock pot version. I also made a "deconstructed beef stew" from a chuch roast that had the eyes of my guests rolling back into their heads. Keep in mind, however, that I do not use any commercially (intensively) produced meat: all is purchased directly from my local farmers. Good quality meat, just like all ingredients, is an essential and HUGE factor for successful SV cooking (as it is for all cooking, I feel). One last thing: I made retrograde mashed potatoes (after learning about them here) using Yukon Golds for Thanksgiving. I used the circulator to fix the starch and people told me that I had ruined them for all other mashed potatoes for the rest of their lives. Crazy, eh? I wonder, if you don't use a circulator (i.e. you are using something like a PID'd rice cooker), can you forgo the bagging and just cook them in the water? I learned all I know from Jackal's great potato primer mentioned here. I'm with the others -- try it all! I've had my SVP for a month and made all sorts of goodies. First the instant gratification -- the quick things are eggs (my fix temp is 146.5 deg F for a little less than an hour) and chicken breast (I hated chicken breast before Sous Vide) at 147 deg F for 40 minutes. Other quick things to help with the excitement were steak and pork, as well as the retrograde potatoes mentioned above. If I were more a fish fan I'd do more fish, but sadly I'm not. Though I did enjoy a fresh piece of cod, I wasn't so much a fan as to go back. Then definitely the LTLT options, once you have the patience. The short ribs for 72 hours are truly amazing. I did the Vadouvan recipe from 4505 Meats. I did try the retrograde potatoes but not vacuum sealed (filled the ziploc with water) but it wasn't as good as the potatoes I vacuum sealed. I don't want to clog my circulator with starch so I'm not intrepid enough to dunk raw potatoes in the bath. I have a 10 pound boneless prime rib I was thinking of doing sous vide for Christmas. Douglas Baldwin suggests 8 to 12 hours at the desired temperature, if I recall correctly. I tend to sear post sous vide, but this may be a case where I should do a pre and post sear. What might others recommend? What are your recommendations for time/temps? Anyone ever do a boneless leg of lamb SV? It is about 90mm round at the largest point. bagging it with a nice generous rub of rosemary, sea salt, and maybe some raj al hanout? Alternatively, some minced fresh mint and parsely, seasoned with a little granulated garlic and made in to a paste with some dijon mustard? I am thinking 54C for 20 hours or so? 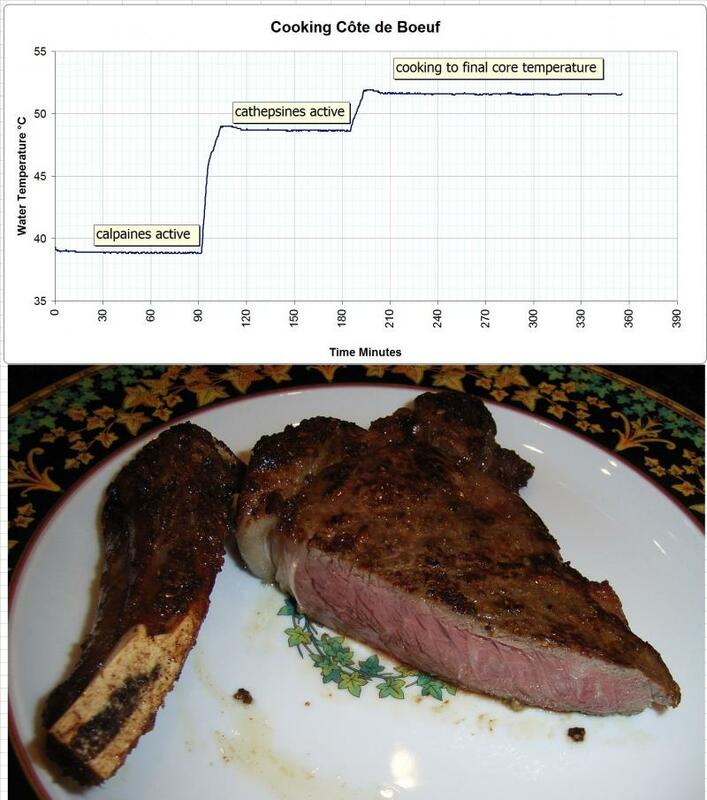 (My circulator is incredibly stable and accurate, varying by .1C up or down and I would like the meat a little on the rare side of medium rare.) Douglas does not mention lamb in his primer so I assume it can be treated like beef? Thanks all. JBailey, I would be very hesitant to SV a prime rib. That is a cut that is usually beautifully tender and lends itself to slow roasting in an oven where the fat can render/soften a bit and keep the meat bathed in flavor. I will be very interested to know what you decide and how it turns out. Quick note: I assumed in my cookbook, since it's for home cooks, that everything was purchased at a grocery store; that is, I assumed the beef was choice and wet-aged about 2 weeks. If you are using a well aged (say 28 day) prime-grade rib roast, then you'll probably only want to bring it up to temperature. If you did get it at the supermarket, then I think you'll want to go the 8--12 hours to tenderize it some. Our family loves lamb and we frequently do boneless leg of lamb sous vide. I usually cook it for 24 hours at 130°F (55°C) and then blowtorch it (with my Iwatani butane blowtorch) until the surface is a nice mahogany brown. Coincidently, I served a boneless leg of lamb last night with the mint pesto recipe in my cookbook and everyone loved it. Lamb is exceptional when cooked sous vide. Given the temperatures involved, the uniform red colour can be a bot off-putting to some but the taste and texture is addiictive. Like Douglas, I cook it at 55C. The picture shows half the cut besides the bone. And I should have wiped the plate before taking the picture. I have a few bags of pebbles, vacuum packed that I keep in the closet. Whenever I plan to cook vegetables, or anything else I suspect might float, I add a bag of pebbles to the sous vide bag/. Works like a charm! Of all the SV cooks I have done in the last six months, Which is when I first started SV, the Chicken Breast reigns supreme. ( no pun intended). I'm curious - what's the go-to water heating method for DIY sous vide? I'm pretty handy with a soldering iron, but the old go-to of connecting two razor blades to line power and submerging them in water seems just a little crude. Merridith thank you for your thoughts on slow roasting a prime rib. One side of my oven is committed to the hotel pan with two turkeys and the other side is for some roasting and preparing of the sides. I have roasted with success many times and agree that the rendering/softening/and crusting imparts a marvelous flavor to the meat. Yet, I am fascinated by trying this sous vide. Douglas, my appreciation and thanks to you for your comments. Yes, mine is a boneless prime rib choice cut from Costco. I am going for 8 to 12 hours (which means a middle of the night start) in my SVS. I may do about 140 F. I also found PedroG's turbo-aging links and thoughts informative. My other question is about fat that was not trimmed off the meat at the store. Since the heat will be about 140 F, my experience is that the fat is soft, but unlike the results of conventional roasting. Logically, I want to trim the excess off the roast, but reserve it and place it on the meat when I vacuum seal it in my chamer vacuum. There would still be enough residual fat that when I sear the roast the exterior will bubble, crust and impart flavor with each slice. However, I find that with the lower sous vide temps that by the time it is carved or passed around the table the temperature of the slices is declining to room temperature (we are slow passers and eaters at our table). Will larding with the cut fat help flavor as the roast is done sous vide or is putting it back in the bag unnecessary? I am going to season, seal and put it back in the refrigerator, then awaken later to put it in the SVS. I had written earlier about doing Phillip Preston's turkey breast recipe with sage and cider. I have two breast to pop into my SVP at 160 F for 4 hours followed by putting them in the oven at 350 F for 30 minutes (I cover mine in buttered cheese cloth while finishing in the over). May everyone trying sous vide, thinking about sous vide, dreaming about sous vide or fortunate enough to be opening presents of sous vide equipment have a very MERRY CHRISTMAS! I like larding very much, see an earlier post. It's fine with veal or beef prime rib! So if you can cut the fat into strips and have a larding needle at hand, DIY (before bagging and cooking). As SV meat is not very hot, always serve on warmed plates. You might post-sear the whole roast, slice for the first serving, (put the rest of the roast in a 55°C oven to await the second serving) and quickly sear every slice on both sides. You find several links in my earlier post, or enter "immersion heater" into the search field and search "this topic", you will find several discussions. A few attempts at making an ice cream base over here in my eG Foodblog. Following a recipe by Paula Wolfert, 82C for an hour. Also a trick for keeping a floating bag vertical in there (string is involved.) Will report there on results. For me, turkey benefits even more from SV. Breast is perfect every time (if turkey can ever be perfect). I've done turkey legs three times since Thanksgiving. This last time I also did turkey thighs. Slathered the meat with a bit of duck fat, 175 F for 6 or 8 hours. Simply incredible. I would not have thought it possible to make something this good at home. I can honestly say I've never had better.